Headlines: This is the last week to fish the rivers and what a week it is going to be with plenty of fish in the rivers and a bit of rain forecast. There are plenty of fish being caught in the lakes and some really good quality fish amongst them. Lake Jindabyne has had a good number of large atlantic salmon released into it from Gaden recently. A few of these larger fish have turned up already and there are a few brook trout showing up as well. 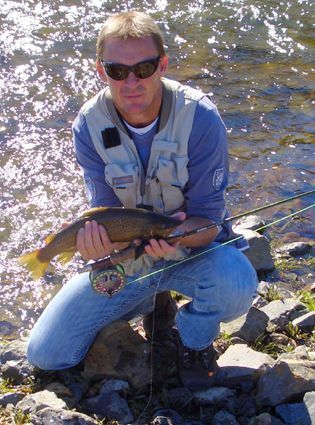 Rivers:- Reports have been very good on the spawning streams and should fish very well this long weekend. It is that time of year when the browns are running along with quite a few rainbows making an apperance in the Eucumbene and Thredbo rivers. Glo bugs and nymphs will be the standard patterns of choice but you could also include a few woolly buggers as well. Tungsten tacky weight is a very good option to get down when the fish are on the bottom in the deeper sections. 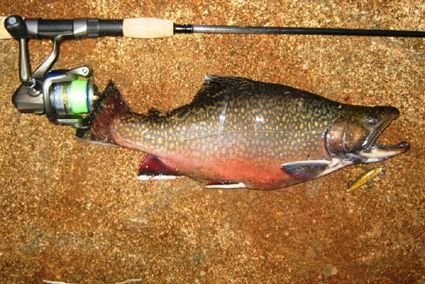 Remember that the Eucumbene and Thredbo rivers have a bag limit of one fish per angler at present and this fish must be 50cm or larger. All fish under 50cm must be released. These flies need to be on or near the bottom to be effective at this time of year. Tugsten putty, Lead shot and weighted flies can be necessary to achieve this. You will also catch way more fish if you stay out of the river. Anglers who wade the centre of the stream are going to catch less, spook more and potentially damage spawning redds. Stick to the bank and stay low for best results. *Mick Patton from the store has had a couple of good sessions catching 3-4 fish a session and all this in the middle of the day. "Getting down" was the key to hooking the fish. Lake Eucumbene:- The lake has been a little hit and miss but there are still enough of those fat rainbows around to keep most anglers happy. A few more browns have started to show though the rainbows are out numbering them considerably. Some good fish have been caught in the Old Adaminaby and Anglers Reach area plus a few have been smoked by big unseen beasts. Well worth a look on dark at the moment. Many of the fish have had daphnia in their stomachs. Lake Jindabyne:- Jindabyne has been great in the evenings with fish coming in from many of the bays and points. Fuzzy Wuzzys and Taihape ticklers along with Black Phantoms have been good. Most of the fish have been rainbows but a few browns are still poking about. River mouth fishing has been quiet this week. There is a heap of weed in many of the bays that is drawing the fish in to the food that it holds. Thanks for your help yesterday, I can now spend my winter learning to cast better and tying flies! 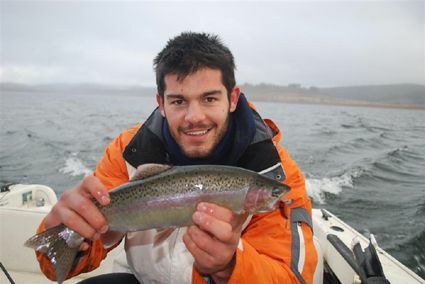 I've attached a pic of a brownie I caught on the lake at Jindabyne on Sunday evening. Not a huge fish by any means but it's the biggest I've caught on fly since I began learning 6 months ago. It was 54cm and just under 4lb clean. I've caught many bigger fish on lures but catching it on fly was a huge thrill! Sorry the picture is not the best, my phone is getting old. I really must buy a decent camera to take with me but I keep spending the money on fishing gear!! 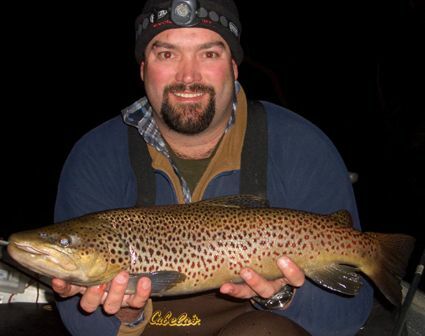 *Dave Maurier had a good session on the lake this week catching some quality browns to 2.5kg. An intermediate line and big woolly buggers were the browns undoing. Eucumbene:- Trolling reports have been quiet though with the amount of boats around this past week there would have been some nice fish caught. 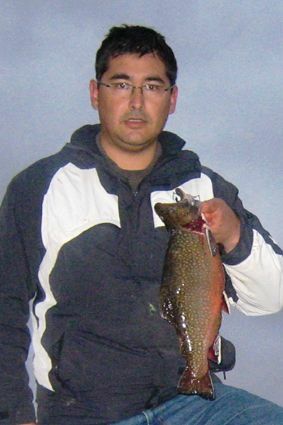 Reports suggest that more open water areas and fishing in the 20-25ft mark has been best. The fish have been eating daphnia in these areas so running lures in the olive, yellow, green type colours should work. Look for large blobs mid water on the sounder and work the area till you find some fish. Trout pattern minnows will work well Rapalas, Attacks, RMG Scorpions and Soft plastics in the trees will be a great "other" method to try. Best areas for trolling continue to be Cobrabald, Waiunui, Collingwood, and the main basin area. Fished the Euc on the weekend for 14 trout to 1 and a half kilos. Got most of them on silver tassies (63 & 68) and Oar Gee Lil' Rippers fishing out of the main basin at Old Adaminaby. Only caught two browns that were very lethargic when hooked. The Bows were all fighting fit with a number of them putting on an almighty acrobatic display ontop of the water when hooked! We fished thoughout the entire day and had a consistent bite throughout. Jindabyne:- Jindabyne has been good with some nice fish taken trolling around the outside of the weed beds in many of the bays. Deeper water and the river mouth have also produced some nice fish with a rumoured 7-8kg fish being caught by an angler trolling from a kayak recently. 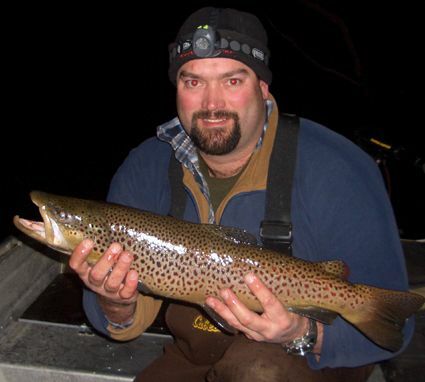 Big nine and eleven cm trout pattern Rapalas would do well on the big browns as will the larger Alex tango lures. Getting these down a bit is the key to the big browns. Rainbows will still take these larger lures at times but smaller minnows and tassies will work a little better. Try Kalkite, Waste point, Creel Bay and Sids Bay. Mudeyes are scarce but the worm and powerbait fishing has been good enough that most have given up using mudeyes. Powerbait has come into its own this past week. Remember to fish it on the bottom but with a light gauge short shank hook, like the Gamakatsu single egg or Daiichi 2171 in a sz 6 are perfect. Best colours have been the Chartreuse and Sherbert nuggets along with Scrub worms have been doing very well over the last week as well. 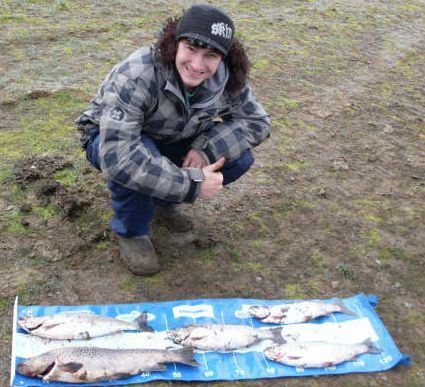 Eucumbene has picked up with some good fish this week. Look for soaks and drop offs for best results. *Josh and Dave had a good session fishing seven gates on the weekend catching a number of quality fish with all but one rainbow taken on orange powerbait. One other fish ate a bardi grub. 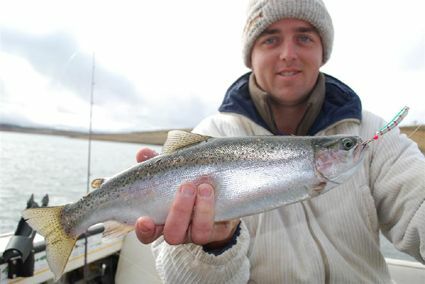 Jindabyne has had some great rainbows coming in and has been a little better than Euc at present. I fished Kalkite on Saturday afternoon from 3 pm. I seemed to get plenty of bites but for some reason, the fish never hooked up. But I got a nice rainbow on worms at 4 pm which provided a bit of entertainment by jumping out of water every five seconds while I was reeling it in. I tried spinning off the banks with and got an undersized rainbow on the celta which somehow managed to wrap fishing line around itself several times and needed a lot of unwinding before it could be released. 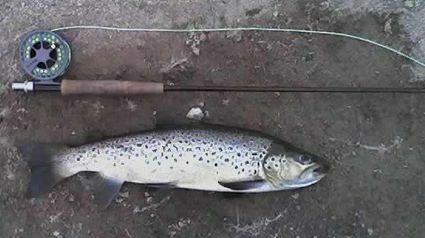 I then gave up on the celtas and tried a small sinking brown trout rapala and got a 1.15 kg brook trout a couple of metres off the bank at 5 pm. Those non-hook setting bites stopped at 5.30 so I packed up and went home at 6.30 pm.